Australia’s series win was confirmed by Glen Maxwell who took it away with his cruciel 96 off 83 balls knock yesterday at MCG, Although it looked liked to be a tight match but Glen Maxwell’s and James Faulkner’s knock assured that they surpass the target of 295 with ease. It was Australia’s third successive record change to seal the five-match one-day series with two more to play. India gave themselves their best chance of the series by having Australia four down inside 30 overs. Indian bowlers managed to get quick wickets including Smith and George Bailey- hero’s of last two matches who were dismissed by Ravindra Jadeja. India came to this match knowing that a run a ball may not be enough to set Australia – it certainly wasn’t in the first two matches of this series. Kohli worked hard to score his 119-run partnership with Shikhar Dhawan and his 109-run stand with Ajinkya Rahane, both of whom made half-centuries. Kholi on other hand broke the record of the fastest one to reach 7000 runs figure by reaching to his 24th ODI century. 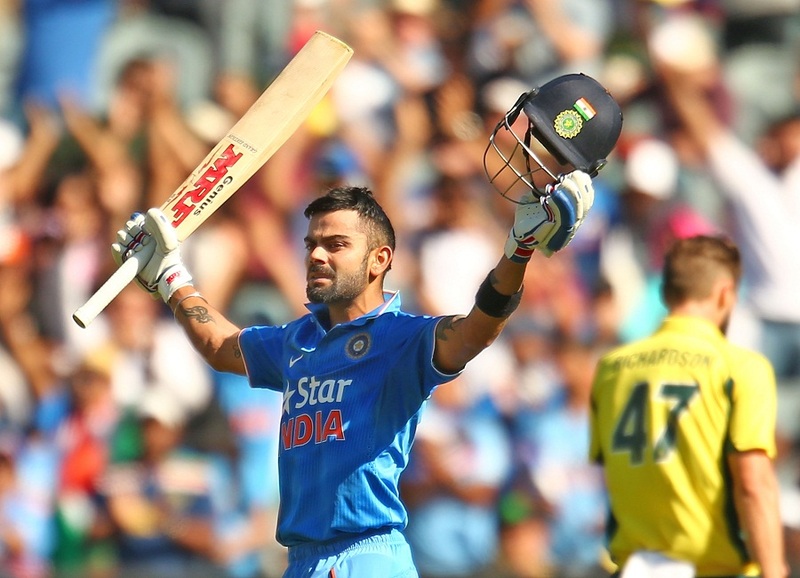 V Kholi celebrating his 24th ODI century. Both Ajinkya Rahane and Shikhar Dhawan also chipped in with half centuries each, But it was not enough as Australian batsman managed to over power Indian Bowlers again in 3rd successive ODI. I hope that our Indian Team bounce back in remaining two matches of the series.